It’s easy to pass over a great game. Not everybody has the time, money, or means to play every critically acclaimed title, and as the years go by, games considered to be “the best” can fall by the wayside. By the time I was old enough to afford my own consoles, I was stuck in a somewhat stagnant Nintendo rut. It wasn’t until a few years after college that I finally picked up a used PlayStation 3 and a few choice titles. Thanks to the PlayStation Network I was able to try out classics like Spyro and Crash Bandicoot long after their late ‘90s heyday. It was thrilling to think that I would get the chance to experience the games so many players had come to love over the past two decades. Unfortunately, these classic games never seemed to quite live up to the hype I had built up within my own mind. Even classic Nintendo titles like Super Metroid and EarthBound, that I had skipped over in my youth, were a bit disappointing for me when I finally got around to playing them as an adult. Despite the legions of fans showering them in praise year after year, I just couldn’t find much enjoyment in my various attempts to complete them. They’re both fantastic games. Just not games suited to my (questionable?) tastes. Last month I picked up the Shadow of the Colossus remake for the PlayStation 4. The original game, for those who don’t know, was released on PlayStation 2 in the fall of 2005 to rave reviews. Shadow of the Colossus was not a game that I was unaware of; in fact I had heavily considered purchasing the game when it received a high definition remaster on the PlayStation 3. I had heard players go on and on about the game’s beautiful environments and simple gameplay for years, but I was worried that the image of Shadow of the Colossus I had in my head would lead to yet another let down. Games that have a reputation for being the best of a genre, the best of a console, or the best of all time carry an unsettling amount of optimistic expectation. You want to love them before you even play them, because so many others do. Any issues that you find within a critically acclaimed classic seem to cut deeper than those found in new titles. You wonder why no one warned you. These imperfections can shatter the illusion that you were going to finally find this flawless, unmatchable, experience that others told you so much about. I dove into Shadow of the Colossus 13 years late and managed to complete the campaign on normal difficulty in just over five hours. It was challenging and rewarding, but not without its flaws. Some wacky physics and forced camera angles had seen me squashed underfoot and bludgeoned to death on quite a few occasions, but overall I had enjoyed my journey. I could appreciate the game for what it was and truly understand what made it so appealing. 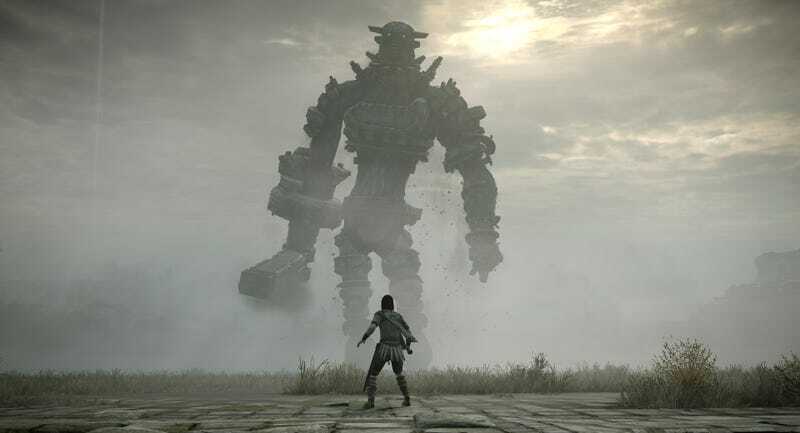 As I jumped back into the game this week to try out some of the time attack boss battles, it dawned on me that the colossi were a fitting representation of classic video games. They were the personification of the unique gameplay, length, quality, and expectations that makeup every critically acclaimed game. Take a gander at Gaius, the sword-wielding giant seen on the left in the illustration above. In my mind he represents Katamari Damacy, the bizarre puzzle game where players are tasked with rolling up everything in their path. My experience with Gaius and Katamari was one of fascination, frustration, and gained confidence. I started my battle with Gaius in awe of his monumental majesty, but soon found that I couldn’t translate his movements into anything viable. After a few aggravating deaths I realized that I needed to get him to shatter his sword on a hard surface before I could ascend any higher on a mangy limbs. Once I had solved this bit of the situation, I made quick work of the big boy and was on my way. Despite a terrible start, it turned into one of my favorite colossi clashes, one I have visited in the boss attack mode multiple times this week. When I first downloaded Katamari as a digital PS2 title, I was perplexed as to how I had overlooked this colorful and zany cult classic for over a decade. From the moment I heard the upbeat soundtrack and saw the vibrant level design I was hooked. My enthusiasm was soon squashed by the games dual-stick control scheme, which caused me to run into walls and skid past necessary items strewn about the ground. Over time, I got the hang of the controls and started rolling up everything in sight. Katamari Damacy became one of my favorite games. Colossi and gaming classics can be both be daunting. They can be stressful and time consuming for some, but encouraging and rewarding for others. Even if a player has a good idea about what they’re getting into, no battle with a colossi or playthrough of classic game goes as planned the first time around. When it comes to playing critically acclaimed games years late, it’s only fair to expect some imperfections. But that fact shouldn’t deter players from attempting to take on a an classic challenge and expand their gaming tastes. Just be happy you don’t have to ride a horse around an enchanted peninsula to find a copy of Super Metroid.